Shipping plastic is expensive. Like paper, a single bag isn't heavy, but once you a pack hundreds or even thousands of bags, the weight begins to add up. A pack might be about the size of a folded shirt but bags are heavier. Most of our product packs are essentially dense bricks of plastic. This makes flat rate a great option for many of our customers. Even though we can't reduce material weight, we can make dimension weight as efficient as possible. For example, our soft-fold boxes ship flat rather than preassembled to reduce on overall space. We give you discounted rates! After years of negotiations and growing the sheer volume of how many orders we ship out daily, we've been able to discount rates across the board. Long gone are the days of the small order fees. We've negotiated down our rates with some of our biggest shipping partners so we can pass those savings onto you. We're here to give you the best packaging experience and pricing in the industry. That means the best products, wholesale pricing, and transparent shipping. We pass on our negotiated rates, which are what shipping carriers charge us. As we continue to grow, we'll do our best to negotiate the best possible rates and pass on every discount that our shipping carriers offer. You deserve 100% transparency when it comes to pricing and shipping. Pick the method that works best for you and trust that we will pass on the best possible rates. UPS Ground - For all 50 states of the U.S.A., plus Puerto Rico. Mail in 1-5 business days. Delivery date guaranteed. UPS 3 Day Select - For the 48 continental of the U.S.A. ("Lower 48"). Mail in 1-3 business days. Delivery date guaranteed. UPS Standard - For the 48 continental of the U.S.A. ("Lower 48"), Canada, and Mexico. UPS 2nd Day Air - For all 50 states of the U.S.A., plus Puerto Rico. Some limitations in Alaska and Hawaii. Mail in 1-2 business days. Delivery date guaranteed. UPS Next Day Air - For all 50 states of the U.S.A., plus Puerto Rico. Some limitations in Alaska and Hawaii. Mail in 1 business day. Delivery date guaranteed. First Class Mail - Affordable shipping for standard-sized, single-piece envelopes weighing up to 3.5 oz. Mail in 1-3 business days. Delivery date not guaranteed. Priority Mail - Mail in 1–3 Business Days. Delivery date not guaranteed. Flat Rate - No weighing or calculating needed up to 70 lbs. Straight forward pricing. You'll find flat rate envelopes and various sized boxes available upon checkout. We'll pick the most affordable option that will accommodate your order. Mail in 1-3 business days. Delivery date not guaranteed. FedEx Ground - Delivers to mostly businesses and some residences. Runs Monday to Friday (and in some cases to Saturday). Delivery date guaranteed. FedEx Home Delivery - Delivers to mostly residences and some small businesses. Runs Tuesday to Saturday. For all 50 states of the U.S.A. 1–5 business days within the contiguous U.S., 3−7 business days to Alaska and Hawaii. Delivery date guaranteed. GSO - Golden State Overnight is available for California orders. XPO - Freight shipping for large orders. Not in a rush? If you are in the contiguous 48 United States, choose "Economy Shipping" when you check out to let us pick the best shipping method for you. Economy orders ship out from ClearBags within two business days of being placed and usually at the the lowest-cost shipping option available. You save some money thanks to your time flexibility. Want to save even more on shipping? The ultimate way to save on shipping is to avoid it altogether by picking up your order at one of our warehouses. If your shipping address is nearby one of our warehouses, you will automatically see the free shipping option "Pick up." We welcome any customers that can take advantage of local pickup. To the right are some of our most frequently asked questions. If you have any questions please contact one of our customer service representatives at 800-233-2630. You're also welcome to call if you prefer to place your order by phone. Do you ship to where I’m located? We ship to all locations in the United States, including Alaska and Hawaii. We ship to most international locations too. You can do a quick check to see if we ship to where you want by creating an order on ClearBags.com and entering in your ship to address. Can I avoid shipping altogether? Yes! You can absolutely do this if you're located near one of our warehouses. During checkout, you should see a "Store Pickup - Collect from Store" option. If this does not appear, please give us a call during business hours. In some scenarios, customers are located beyond the range of local pickup but will be in the area to pick up the order. Calling us will be your best option and we'll confirm that we're open the day you plan to be in the area. We pride ourselves on speed, accuracy, and proper care of your order. Orders placed before cut-off times and NOT using the economy shipping method will leave our warehouse the same business day. Those placed after cutoff will ship the following business day. As of right now, 98% of all orders ship within one business day. Transit time will vary depending on the carrier and shipping method chosen. Orders with "Economy Shipping" method ship as fast as possible, but are promised to ship within two business days (48 business-hour ship priority). We work with a variety of shipping carriers: UPS, USPS, FedEx, GSO, and XPO. Different options will automatically show based on your order and location. If you do not see your preferred carrier in your provided shipping quote online, please give us a call. Can I use my collect account? Yes. Please contact our customer service department (800-233-2630) and have your collect account numbers ready. They will add them to your account and will process shipping via your selected account. Every order placed online will receive an order confirmation email that is sent immediately upon purchase and a shipping confirmation email that is sent once we scan an order that is departing one of locations. The shipping confirmation email will will contain an order tracking number that you will be able to use to look up your shipment on the specified carrier's website. Unfortunately, not at this time. Orders placed after cut-off times on Fridays or holidays, will resume on the following business day. Weekend orders will begin to process on Mondays (unless it is a holiday). Changes can be made to weekend orders if you call us first thing on Monday morning! What are the shipping cut-off times? Shipping cutoff times are 2:00 p.m. Eastern for our Tennessee warehouse and 2:00 p.m. Pacific for our California warehouse. 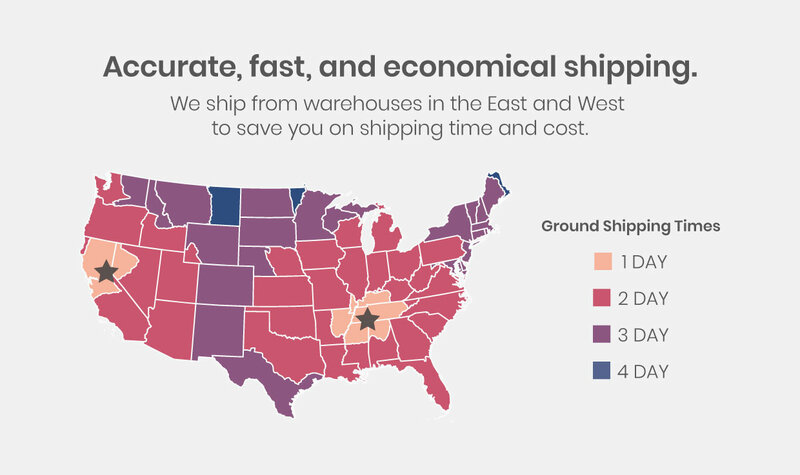 Your shipment will automatically ship from the closest location to save you on shipping time and cost. Our goal is to delight our customers with innovative packaging options AND outstanding service. If you’re not satisfied with your order, call us and we will do all we can to make it right. ClearBags will accept returns on stock items for up to 60 days from ship date. There are some excluded products of course, but most of what we have falls under the above policy. The exclusions: We cannot accept returns on orders over 60 days old (from ship date), closeout items, backing boards or foam board (any kind), or custom products. We also cannot accept returns on opened food-safe items (and we will never re-sell opened food-safe items). Please only open one or two packs in your order when checking food-safe products, as this will limit the number of unreturnable items. We will accept the remaining unopened items in your order. We are not responsible for any costs incurred due to order changes or cancellations (e.g., return shipping fees). Our fault? We’ll take care of it. 100% of your purchase--shipping and handling included--will be refunded. To address this quickly, we recommend that you inspect orders for accuracy and damage within 48 hours of receiving the package (Pictures help! Please take a photo of any damaged items.). Claims for shipment damage should be made via the freight carrier according to policy (see Shipping Damage section below). Customers must keep all original packaging while filing a claim. We don’t know what that is. Restocking fees are a thing of the past. If you return a new unopened item, we don’t charge you a restocking fee. Not even a cent. It’s that simple. State the reason for the return (e.g., damaged item, no longer want/need, etc.). When it comes to damaged or defective items, we would truly appreciate pictures if you have the time to share with us. This will help quality control. Wait for approval. You'll hear from us within 1-2 business days. Print your return label and ship the package back to the address that we provide to you. Upon receipt of the returned items, your credit card or account will be credited with the authorized return amount within two business days. All delivery claims and return authorizations must be approved by a ClearBags Customer Service Representative. In the event that we have made an order error we will replace product and ship via ground transportation or a carrier of our choice. We are not responsible for expedited shipping in the event an order error has occurred. Damaged product should be made available or returned to ClearBags upon request before credit is authorized and should only be discarded at our request. We will ship product via the lowest cost shipment method unless directed otherwise by the customer. When shipping carriers are used, each customer acquires legal ownership of the product when it ships from ClearBags dock. Unfortunately, once a package leaves one of our facilities, the responsibility falls into the hands of the carrier chosen for your shipment. Claims for shipment damage should be made via the freight carrier's policies. In the event that there is a shipping problem, ClearBags will assist customers with the freight carrier to the extent possible. A confirmation e-mail with the tracking number, if applicable, will be sent to the e-mail address on file. Most orders ship the following business day. Pre-cut and custom orders may take additional time. Out-of-stock or backordered items will either be replaced with an equivalent or better alternative. One of our team members will inform you of the situation and provide you with the options available. To the right are some of our most frequently asked questions. If you have any questions or would like to proceed with a return, please contact one of our customer service representatives at 800-233-2630. You're also welcome to call if you prefer to place your order by phone. Do I qualify for returns? New and unused items? All products within 60 days of their ship date can be returned with the exception of closeout items, backing/foam boards, and custom orders. All sales on closeout items, backing/foam boards, and custom orders are considered final and no returns will be accepted unless there is error on ClearBags' part. Damaged or defective items? Orders damaged during transit are best resolved directly with the shipping carrier (i.e., Directly with UPS, USPS, FedEx, etc.). However, if a product is defective, we'll cover 100% of the return and replacement shipping costs. Sent the wrong items? Our fault? We'll cover the return shipping costs and ship you the correct items. See our return process above for steps on how to initiate a return. I bought the wrong item, can I exchange for something else? Yes! We want you to get the best packaging for your specific needs. The only items that cannot be exchanged are backing/foam boards and custom orders. Keep in mind that you'll have to cover the cost of return shipping. Pro Tip: Order a sample of an item before committing to a larger order. Experiencing our packaging in person will help you understand mil, material type, and the various features different products have. Do you offer returns on open items? We cannot accept returns on opened food-safe items (and we will never re-sell opened food-safe items). Please only open one or two packs in your order when checking food-safe products, as this will limit the number of non returnable items. We will accept returns on all unopened items. Do I have to get my returns approved? Yes. At this point we'll have to approve all returns before they're shipped back to one of our facilities. Follow the above steps to initiate a return and get your return approved. It depends on the situation. If you receive and item that wasn't a part of your order, we'd take full responsibility and pay shipping expenses. However, normal returns i.e., returns because you ordered the wrong item or because you dislike a product, etc. will be subject to the customer paying the return shipping costs. 60 days from the ship date. No. We don't have any restocking fees for product returns.